In Alaska, Steller sea lions range from southeastern Alaska north and west through the Gulf of Alaska, along the Aleutian Islands chain and into the Bering Sea. They are currently listed as endangered in their western Distinct Population Segment (wDPS) and have been delisted from their former threatened status in their eastern DPS. These populations are divided at Cape Suckling, Alaska, which lies between Prince William Sound and Yakutat. In the wDPS, sea lion numbers declined between the 1970s and 1990s. The overall decline ceased in 2000, with modest increases east of Samalga Pass while declines continued to the west. Meanwhile the eDPS has steadily increased at approximately 3% per year. Steller sea lions occur at over 300 haulouts and breeding rookeries (in red) across the northern Pacific Rim from the Kuril Islands to California. Within the United States, the population is divided at Cape Suckling into western and eastern Distinct Population Segments. The ADF&G Steller Sea Lion Program works closely with the National Marine Mammal Laboratory (NMML) to estimate vital rates of Steller sea lions, in particular, age-specific survival and reproductive rates. By comparing survival and reproductive rates between these regions of differing population trends we hope to identify factors that help explain these differing trends. During skiff and land surveys, persistence is required to identify and photograph marked sea lions from among the hundreds of others hauled out. By re-visiting these locations year after year, we can identify individual sea lions to determine, over time, the rate of survival, the reproductive rates and time at first reproduction of females, their geographic shifts in choice of breeding rookery and rates of entanglement in marine debris. As an example, this female sea lion was marked as a pup at Hazy Islands rookery in 2001 and resighted at the Inian Islands in 2003. She eventually went on to produce a pup at her birthplace in June 2009. ADF&G and NMML have permanently marked, by hot-branding under anesthesia, sea lions for individual identification at rookeries throughout Alaska. Every summer, both agencies follow up on this work by conducting brand-resight cruises during which nearly every sea lion haulout and rookery in Alaska is visited by biologists in small skiffs. We also work closely with the University of British Columbia, the Alaska SeaLife Center and the University of Alaska to collect resights of branded animals in British Columbia and the Gulf of Alaska. ADF&G biologists are also stationed at four remote field camps where they conduct land-based observations of rookeries. We resight animals during other seasons for specific projects or opportunistically during other types of fieldwork. During these skiff and land-based surveys, biologists conduct counts, photograph branded animals, and collect behavioral data (for example, whether a female has a nursing pup or an adult male is defending a territory). Resightings of branded individuals are used in mark-recapture models to estimate survival, reproductive rates and the age of weaning. To date our database of resighted animals exceeds 32,000 brand resights confirmed using photographs. Hastings, K.K., T.S. Gelatt, and J.C. King. 2009. Postbranding survival of Steller sea lion pups at Lowrie Island in Southeast Alaska. Journal of Wildlife Management 73(7):1040–1051. DOI: 10.2193/2007-208. Kaplan, C.C., G.C. White, and B.R. Noon. 2008. 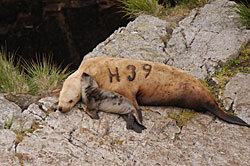 Neonatal survival of Steller sea lions (Eumetopias jubatus). Marine Mammal Science, 24(3):443–461. Pendelton, G. W., Pitcher, K. W., Fritz, L. W., York, A. E., Raum-Suryan, K. L., Loughling, T. R., Calkins, D. G., Hastings, K. K. and Gelatt, T. S. 2006. 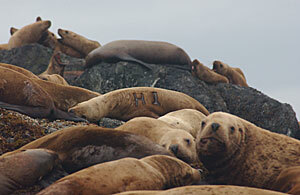 Survival of Steller sea lions in Alaska: a comparison of increasing and decreasing populations. Canadian Journal of Zoology 84: 1163–1172. Pitcher, K. W., Burkanov, V. N., Calkins, D. G., Le Boeuf, B. J., Mamaev, E. G., Merrick, R. L., and Pendleton, G. W. 2001. Spatial and temporal variation in the timing of births of steller sea lions. Journal of Mammalogy 82(4): 1047–1053. Pitcher, K., Olesiuk, P., Brown, R., Lowry, M., Jeffries, S., Sease, J., Perryman, W., Stinchcomb, C., and Lowry, L. 2007. Abundance and distribution of the eastern North Pacific Steller sea lion (Eumetopias jubatus) population. Fishery Bulletin. 107: 102–115. Raum-Suryan, K. L., Pitcher, K. W., Calkins, D. G., Sease, J. L., and Loughlin, T. R. 2002. Dispersal, rookery fidelity, and metapopulation structure of Steller sea lions (Eumetopias jubatus) in an increasing and a decreasing population in Alaska. Marine Mammal Science 18(3): 746–764. Contact the ADF&G Steller Sea Lion Program at dfg.dwc.sealions@alaska.gov. A female originally marked as a pup at Hazy Islands rookery in June 2001 is resighted with her own new pup at Lowrie Island rookery in June 2009. Mark-resight work shows us how often sea lions produce pups and at what age they begin. If you see a branded sea lion, we’d like to hear from you! Photographs of the sea lion and its brand, the date, and location are very valuable pieces of information that we can use. Photographs of branded sea lions that are entangled by marine debris, suckling their pups or nursing from their mothers are also valuable. Please keep in mind the Marine Mammal Protection Act prohibits anyone from disturbing marine mammals unless authorized by NOAA permit, and it is wise to keep a distance of 100 yards between yourself and sea lions on their haulouts. Please send photos along with date, specific location, and your contact information to dfg.dwc.sealions@alaska.gov. Thank you! To report an injured or dead marine mammal: please call the National Marine Fisheries Service Alaska 24 hr Stranding Hotline: (877) 925-7773 or (877) 9-AKR-PRD.